Lady H's last day of preschool was this past week and I wanted to do something for her teachers and friends. She has had so much fun going and it sure has helped Mr. Bites get some work done since he works from home AND takes care of her during the day. Yeah, he's pretty amazing. I was going to make little cupcakes, but decided that little whoopie pies would be easier for tiny toddler hands to hold. When I saw this vanilla whoopie pie recipe in my newly purchased Whoopie Pies book, I instantly thought of adding sprinkles in the batter for a fun and festive treat that is perfect for kids of all ages. 4 T. unsalted butter, at room temp. Preheat oven to 375. Line two baking sheets with parchment paper or silicone baking sheet. Sift together the flour, baking powder, and salt onto a sheet of waxed paper. In a bowl of a stand mixer fitted with a paddle attachment, beat together the butter, shortening, and both sugars until light and creamy, about 3 min. Add the eggs and the buttermilk and beat until combined. In a measuring cup, combine the milk, baking soda, and vinegar. Add the milk mixture to the batter along with the flour mixture and beat on low until just combined. Add the vanilla and beat for about 2 min. until completely combined. Stir in sprinkles. Using a spoon or ice cream scoop, drop about 1 T. of batter onto one of the prepared baking sheets and repeat, spacing them at least 2 inches apart. Bake one sheet at a time for about 10 minutes each, or until the cakes begin to brown. Remove from the oven and let the cakes cool on the sheet for at least 5 min. before transferring them to a rack to cool completely. In a large bowl, beat together the powdered sugar and butter, starting on low and increasing to medium speed, until the mixture is crumbly, about 1 minute. Add the heavy cream, vanilla, and salt and beat on high speed until smooth, about 3 minutes. These look delicious. I love all the color. They're so happy! I love these! Funfetti is the best. I just love all the sprinkles and the color, what can I say, I'm a kid at heart! Wow! my niece and nephews will surely love this! just adorable. These look so fun and yummy! 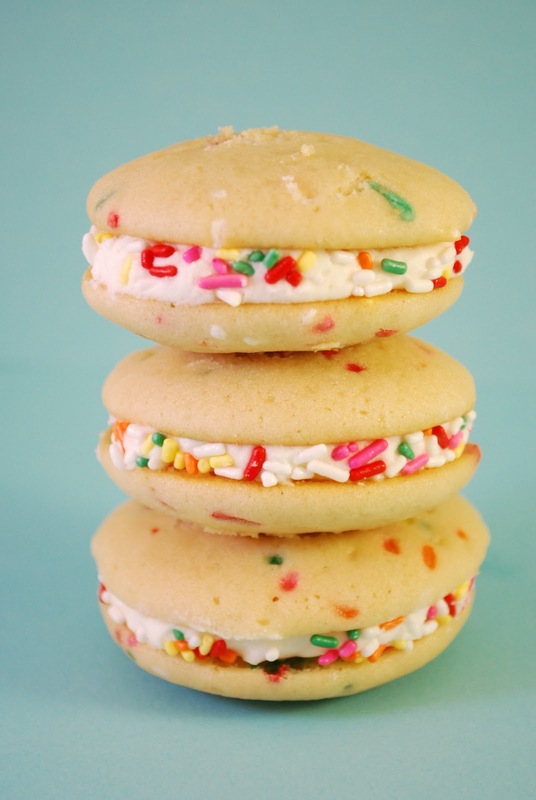 Sprinkles make everything better, don't they?